A sturdy all-season wheel and tyre combination will see you safely from A to B at all times of the year and in any weather. Why not opt for all-season tyres on steel wheels for optimal levels of durability? While they might not offer the same sophisticated choice of design as their alloy counterparts, their robustness can't be beaten. 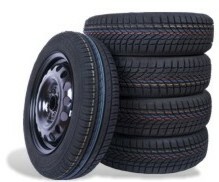 The mytyres.co.uk order process allows you first to select your desired steel wheels - enter the make and model of your car and we'll show you only those products that are approved for use with your vehicle - before moving on to choose your all-season tyres, for which the same principle applies. When both components are selected, we'll assemble your complete wheels, balance them and ship them to your delivery address.